It’s all a bit sad, really, when you look at the state of politics in Australia right now. A re-hashed sexist joke on a menu is making headlines around the world, and our politicians have become a laughing stock. 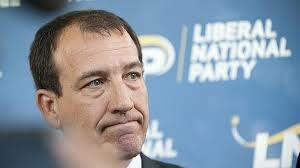 Whichever story you believe – and there’s a dizzying amount of side-stepping and reversing on facts about MENU-GATE – the simple fact remains – that Liberal National Party candidate Mal Brough should step down. Regardless of whether the Julia Gillard MENU MONSTROSITY was actually on tables on the night of a fundraiser for Mal Brough, or not – the shameful fact is, that the rest of the world believes it was. Just check online and you’ll see. It’s all over The Guardian and the BBC in the UK, The Huffington Post in the US, The India Times and in Canada. Makes you proud to be Australian, doesn’t it? 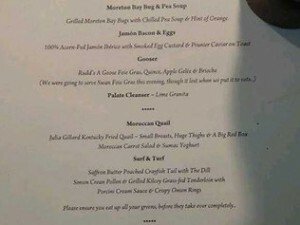 Just in case you haven’t read about it by now, the menu designed for this Liberal National Party fundraiser listed one dish as “Julia Gillard Kentucky Fried Quail Small Breasts, Huge Thighs, and a Big Red Box”. Hilary Clinton copped a similarly crude Kentucky joke back in 1993 – except hers also included a line about taxes. It’s downright revolting. The big question for me is why was Mal Brough apologising for the menu yesterday morning – denouncing it as ‘offensive and inappropriate’ – but then took another TEN hours to bring the restaurant owner into the scandal to claim the menu was never distributed on the night? Why didn’t Mal say that in the first place? The public can’t help but help question his credibility when such a time difference smacks of slamming the gate shut after the chicken has flown the coop? What kind of representative of the people will he be if he can’t manage a crisis and stop a tsunami of global outrage? It was also the words he used to describe the ‘incident’ that were offensive. That the person who wrote the menu thought it was ‘humorous’ and ‘didn’t mean any harm by it’ massively downplays the seriousness of the offence. It shows support for the ‘Boys Club’ mentality, where it’s just considered a bit of fun and a joke to denigrate women and their body parts. Guys, really? Yes, we have breasts and vaginas and you have penises and back-hair, but can we stop laughing about it, get dressed, grow a brain and get back to work? Regardless of your political persuasion, it should also be regarded as highly offensive to insult the head of our country – OUR PRIME MINISTER – in such a disgusting and sexist manner. The Prime Minister says the Opposition should dump Mr Brough as the candidate for the Queensland seat of Fisher, over what she describes as a ‘grossly sexist and offensive’ fundraising menu. I’m not sure whether she’ll change her tune after hearing the restaurateur’s side of the story, but again, he spoke up just a little too late. Let’s get with the program guys – we all understand social networking, don’t we? Even if the restaurateur’s story is true, many voters won’t buy it. To prove otherwise, Mal needs to hold a media conference with all guests who attended the function, swearing under oath that the menus were never sighted. And that will never happen. So Mal Brough, whether he likes it or not, has just served Labor a gold-coated ten-metre high croquembouche on a giant platter. Christ, even former prime minister Kevin Rudd, for once, is publicly standing by his leader. At last, a small show of unity and respect, although no doubt the on-going and damaging rumours about a threat to Ms Gillard’s leadership will continue. Like Mr Rudd, I’m highly sceptical of Mr Brough’s ignorance. ‘He knew what he was doing, he got sprung, he got found out, and now he’s trying to run a million miles away,’ said Kev. What’s even more surprising is that Tony Abbott is standing by his man. 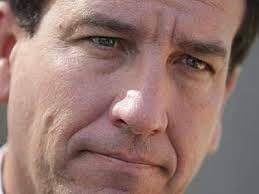 He’s condemned the menu but says it shouldn’t cast any doubt on Mr Brough’s preselection for Fisher. REALLY? Really, Tony? C’mon… Surely Tony must want to kick Mr Brough’s posterior from here to the furthest soup kitchen in Kentucky? His handling of the affair just gave Ms Gillard more ammunition to let the world know (again) what a sexist party Mr Abbott is leading. She described the menu debacle as following a ‘pattern’ from the Liberal Party. 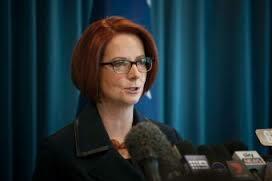 ‘Mr Abbott’s solution to this pattern of behaviour is not to show any leadership. I mean, he’s effectively stood by Mr Brough,’ she said. There’s been strong condemnation of Joel Madden being busted with five grams of marijuana in his hotel. Not smart, but at least he had the decency to keep his misdemeanours behind closed doors. Now there’s a scary thought. What would the cops find if they raided Mal’s place? I’m not suggesting a drugs scandal, but they might just uncover an ancient box set of ‘The Benny Hill Show’ lying next to the ‘Dummies Guide to Politics’.